It used to be too dangerous to have a person work alongside a robot. But at a South Carolina BMW plant, next-generation robots are changing that. Next generation robots could function much more safely and intimately with humans in manufacturing environments, increasing the productivity of workers. I, auto-worker: A robot works in unprecedented proximity to humans at BMW’s manufacturing plant in Spartanburg, South Carolina. BMW has taken a huge step toward revolutionizing the role of robots in automotive manufacturing by having a handful of robots work side-by-side with human workers at its plant in Spartanburg, South Carolina. As a new generation of safer, more user-friendly robots emerges, BMW’s man-machine collaboration could be the first of many examples of robots taking on new human tasks, and working more closely alongside humans. While many fear that this trend could put people out of work (see “How Technology Is Destroying Jobs”), proponents argue it will instead make employees more productive, relieving them of the most unpleasant and burdensome jobs. 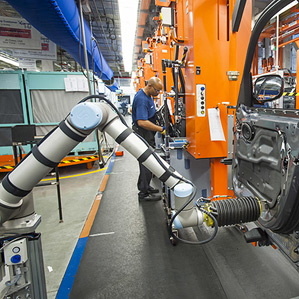 Robots have been a part of automotive manufacturing for decades. The first industrial robot—a hulking 4,000-pound arm called the Unimate—attached die castings to car doors at a GM production line in 1961. Such manufacturing robots have been powerful and extremely precise, but it’s never been safe for humans to work alongside them. As a result, a significant number of final assembly tasks, in auto plants and elsewhere, are still performed almost entirely by hand. In recent years, robot manufacturers have realized that with the right software and safety controls, their products could be made to work in close proximity to humans. As a result, a new breed of more capable workplace robot is rapidly appearing. One of the most prominent examples is Baxter, made by Rethink Robotics, a Boston-based company founded by the robotics pioneer Rodney Brooks. Baxter has a torso, a head, and two arms; it is safe to work alongside, and it can be taught to perform new tasks simply by moving its arms through an operation (see “This Robot Could Transform Manufacturing”). So far, Baxter has largely been deployed in small U.S. factories, where it helps package items moving along a conveyor. BMW’s effort represents a more significant push into heavy-duty manufacturing. Shah’s team has built robots capable of these tasks on a simulated production line at MIT. After the control software has been tested sufficiently at BMW’s lab, the robot will be deployed on one of its real assembly lines. “It’s a fantastic navigation and controls challenge, and it hasn’t been solved before,” Shah says.